From the North Georgia Mountains to the Chattahoochee River along a Cherokee Indian trail, a tiny village named New Prospect Camp Ground was formed. This village, made up of tents, a log school, and arbor became a trading post where Indians and white settlers exchanged their goods. The surrounding countryside provided rich farming land, especially for cotton. On December 11, 1858, the town was chartered and became the county seat of Milton County. Alpharetta's city website states the name is a combination of the Greek words for "first" and "town", however "town" in Greek is "Poli" or "Polis" and "Retta" is not even a Greek word. Officially chartered on December 11 of that year, Alpharetta served as the county seat of Milton County until the end of 1931 when Milton was merged with Fulton County to avoid bankruptcy during the Great Depression. The Alpharetta Farmers Market is a weekly farmers market in the downtown area that opens every Saturday from 8 AM to 12:30 PM from April to October, and features farmers and gardeners from the surrounding area selling fresh vegetables, flowers, and edible goods such as jam. 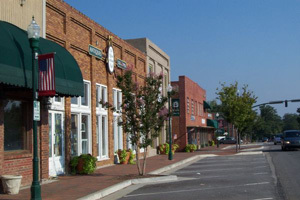 Named "Best Saturday Morning Excursion" in 2007 by Atlanta Magazine.The Downtown Alpharetta Historic District is located in the center of Alpharetta at the convergence of North Main Street, South Main Street, Milton Avenue, and Academy Street. Around this area are several historic buildings dating from the late 19th century and older. The downtown area has been restored, replacing more modern buildings with period structures, and includes dining, shopping, and widened brick sidewalks.